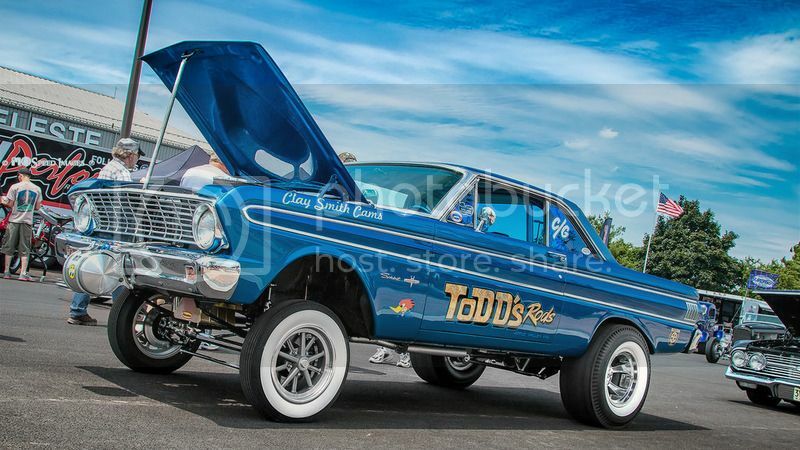 What in the heck is a GASSER anyway? In the beginning there were no classes. You ‘run what ya brung.’ But as the sport began to grow, a more formalized class structure began to develop. Gassers or Gas class cars (officially later called Gas Coupe and Sedan) were hot ‘street’ vehicles, definitely hot rods. Typical might be a 1940 Ford, or a 37 Chevy. Lightweight cars, available cheap. The drop in a V-8 Lincoln or Cadillac or a flathead Ford, and you got a hot car. Gassers were always intended to resemble street vehicles. A full body with fenders which could be trimmed but not removed, A full frame chassis, upholstered seats, working headlights, taillights etc. Running boards could be removed; suspensions altered and drag slicks used. Due to the lack of truly wide and sticky tires, and the lightweight of these vehicles, traction was always a problem. Perhaps the first to grasp the concept of ‘weight transfer’ as it relates to vehicle center of gravity, were the Ramchargers racing team. By jacking the car high up on its tip toes, the weight of the car would shift easily rearward when the car launched. Since all the front wheels had to do was steering, tiny and narrow tires would be used up front to minimize friction drag. 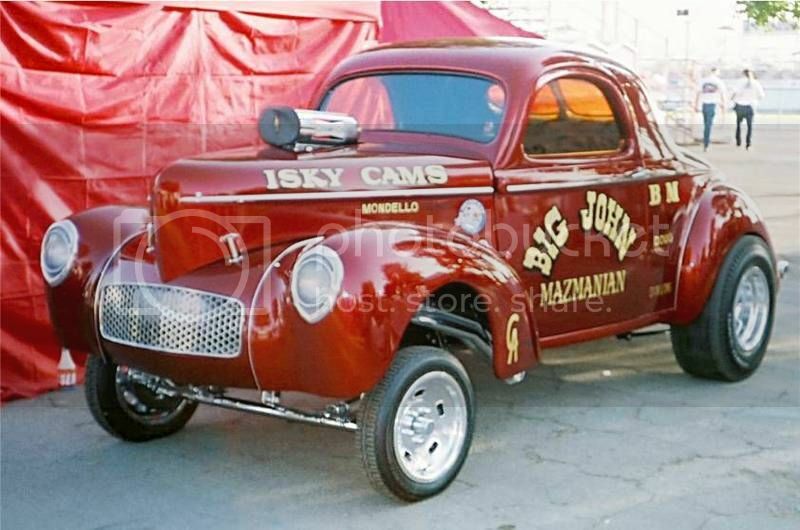 So there you have the typical Gasser. They were full-fendered, without running boards, standing tall, with a supercharger or injectors piercing the hood. The most common mounting for the fuel tank was in the grille area and tank of choice was usually a Moon tank, made by Moon equipment. This gave the cars a very distinctive appearance. Straight axles, being lighter in weight than a frame front ends, were the norm. Some of these cars looked on the unstable side, but fans loved them. The real heyday of these cars was the early to late sixties. We’ll touch on the decline in popularity as well. One thing making these cars popular was the cheap and ample supply of prewar sedans and coupes. 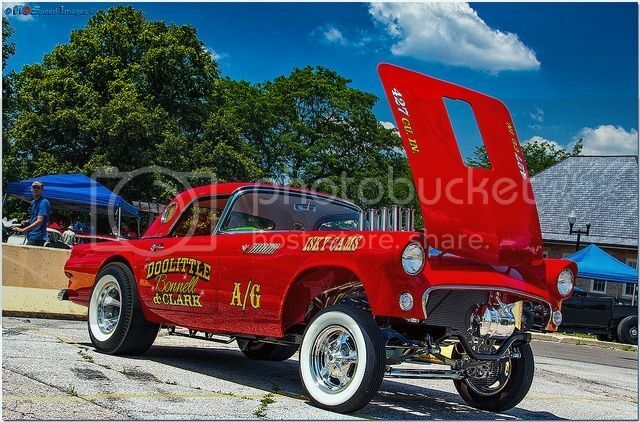 “Real’ hot rods were roadsters and post war everyone wanted a modern appearing vehicle for their garage. When the 1949 Ford came out with the integral fender appearance we are so very familiar with today, it made the old sedans look very old and stuffy. 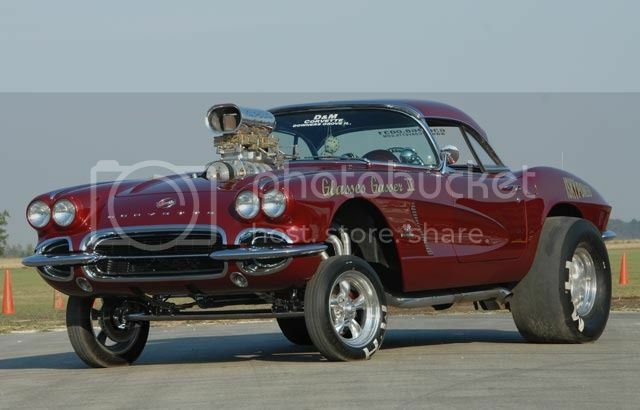 So hot rodders gobbled them up. Many times a kid could get a car for free, if he hauled it away. Cars did not last nearly as long then. At 40-50 thousand miles the average family car was in rather sad shape. Mechanically, I mean. Engines needed valves ground, or a new set of rings, springs were sagging. Who wanted that? So the natural yearning of hot rodders and the supply met. 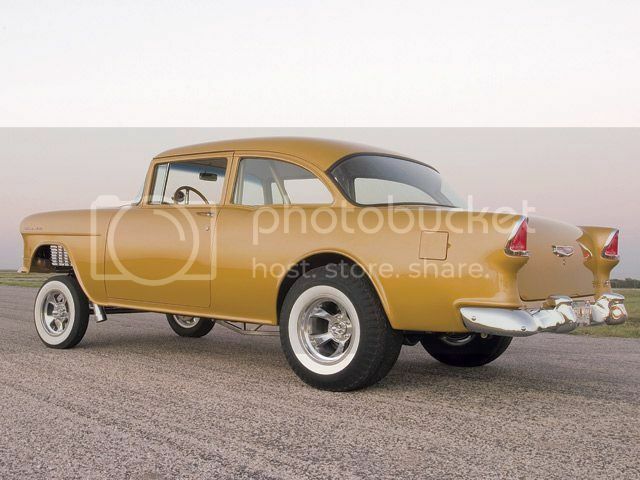 Old fuddy-duddy sedans and coupes were raised, chopped, channeled, engines swapped and racing tires mounted. A new look was born. Not the sleek low slung roadster, but a clumsy looking, high stepping, big engine-ed drag car. Beauty is in the eye of the beholder! Over time, these cars became more purpose built cars, never driven on the street. One thing remained steadfast. Only Gasoline was ever permitted as a fuel. The smell of burning rubber as the slightly sweet smell of Gasoline permeated the grounds when the Gassers Raced. These cars were so popular in the sixties, speed equipment manufacturers began to use them and their personalities in their advertising. “Camshaft Wars” were conducted in the press of the day and flyers proclaimed showdowns between the likes of Stone Woods and Cook, Big John Mazmanian, and others. Iskendarian proudly proclaimed their cam was the hottest, while Clay Smith (with one of the most memorable logos in drag race history, the “Angry Woodpecker”) touted his cam, as the best to race with on Sunday. Match races were common and popular, as the biggest names, “threw down” wherever track operators were willing to throw down cash. One appeal of the gassers, aside from their very distinctive appearance, was the variety of cars that you would see. In lower classes such as C/Gas and D/Gas, Tri-Five Chevies were popular, as well as many other “family sedans gone bad” were raced. By the way, gassers were classed in an interesting fashion. You would calculate the cubic inch displacement of the engine used and divide that into the weight of the vehicle. The ratio determined class, with separate groups for supercharged and non-supercharged cars. What a glorious heyday they enjoyed! A ‘hot rodder’ could still compete. Sponsorships were still pretty much of ‘Johnson’s Garage’ size, engine swap candidates were plentiful, and cheap, old ‘stuffy’ big fender-ed cars were plentiful. Gassers were a hot ticket, for the fans and for track owners. Click on logo to view NTRA Gasser rules.